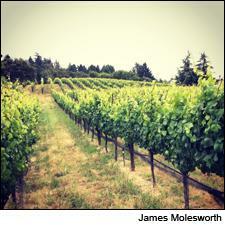 Falstaff Vineyard, in the hills west of Sebastopol, Calif.
Jamie Kutch is living the life. After cashing out on his Wall Street gig, the native New Yorker picked up and headed west to start his own wine label, which debuted in the 2005 vintage. He had success early and, now in his tenth vintage, he seems to be settling in, producing cool-climate Pinot Noirs with a distinctive profile. Kutch produces only a few bottlings; he's considering adding a 2013 Chardonnay to the lineup. His production currently stands at 2,500 cases annually and he has little desire to grow much past 3,000 cases. While he likes to do as much as he can himself, his current priority is finding his own winery facility (he currently leases space in a custom-crush warehouse in Sonoma) and that has proved taxing. "In a perfect world I'd do only vineyard work all day, every day," said Kutch, 40. "But I've got to run a business also, from looking for a winery facility to other things. So having a grower who's on top of things is critical to helping me make good wine." Like many small, developing labels in California, Kutch owns no vineyards, but rather purchases fruit. We headed out west of Sebastopol, up into the hills to visit the Falstaff Vineyard, owned by Ron and Judy Lougheed. Planted in 2000, the 6-acre vineyard has just Pinot Noir vines, utilizing the well-known 777 and 115 clones, as well as the less popular but intriguing 828 clone, marked by its upright growing bunches. "That's pretty rare," noted Lougheed as we walked the rows. "A suitcase clone brought in by Gary Andrus." "But this is a rare site," added Lougheed. "If you want grapes at 25 Brix, you need to go elsewhere. This is a marginal site and ripening is tricky. We had Syrah planted here in the beginning but it never got ripe. So it's only Pinot Noir now." Lougheed, 75, a retired chemist, caught the wine bug as a consumer. "We drank wine all along and always toured the area around here," he said. "But then we had kids," chimed in Judy. "So, during those years we drank more wine, but cheaper wine. The Hearty Burgundy years," she laughed. Once the kids were up and out the door, the Lougheeds eventually bought a property and, after retiring from his previous career, Ron put in grapevines. "Now I can finally drink the fruits of my labor, where in my previous job, I definitely wouldn't want to have imbibed anything I made," he said. "He's in his vineyard every day," said Kutch. "When you're on top of things like that, it makes a difference. Since I use stems and pick early, I really need a relationship with a grower that works well and understands the details and timing. If he waters too late and the sap is running, I can't use the stems. I need a grower who's on board with what I'm doing." Kutch's wines have a distinct profile: crunchy in feel, with briary tannins that add dimension and lift to the pure, elegant fruit. Tasting from barrel at his warehouse space in Sonoma, the 2013 Pinot Noir Sonoma Coast Falstaff Vineyard has vibrant red currant and red cherry fruit with a spike of savory running through it, followed by a long, detailed finish that lets a rose petal note linger. The 2013 Pinot Noir Sonoma Coast Campbell Ranch Vineyard goes into the Sonoma Coast blend bottling; it's sleek, with red fruits and a violet echo. The 2013 Pinot Noir Sonoma Coast Sonoma Stage Vineyard is the other half of the blend, and it delivers darker fruit, fleshier tannins and a broader feel. The 2013 Pinot Noir Sonoma Coast Bohan Vineyard shows a tighter focus, with cherry paste and raspberry coulis notes. Finishing with the 2013 Pinot Noir Sonoma Coast McDougall Vineyard, the wine shows fruitcake and dark plum fruit with a very grippy finish. "I love Burgundy," said Kutch when discussing the model for his wines. "But I'm not trying to make Burgundy. I'm trying to make California Pinot that can age a really long time."